My December holidays started with drinks at a friend, followed by supper out at the new Chinese place in the village. We got home late and after reading a chapter of my book I went to sleep hoping for a long lie in. I was awake by 5am and after pretending to sleep so that the dogs would settle down I got out of bed at 6am and made coffee. I had mine hot, read my book and blogs before making breakfast. After doing a few errands I turned my hand to baking this bread using pure instinct as to the baking time. My intention was to make rolls so I halved the recipe, but the batter was too thin for that so I placed the ingredients into my terrine, set the oven temperature to 180° Celsius and 20 minutes baking time and hoped for the best. I was most impressed with my guess work! 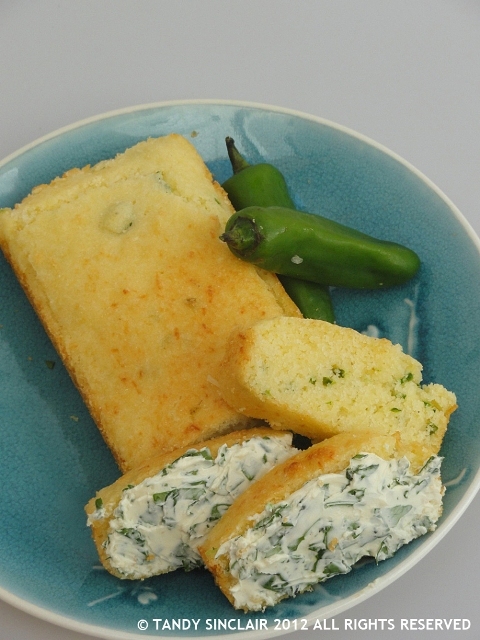 Be careful however as this bread has quite a kick to it – and if you can handle the heat add another chilli. I served it with chopped coriander mixed in to plain cream cheese. can you handle chilli heat? This looks fantastic! Bring on the heat! Tandy, this bread with chili and cheese sounds and looks fabulous…I think I can have it just like this…love the texture of it as well. I like spicy and your bread sounds delicious. I especially think it would be good with your cream cheese mixture.